Florida, Georgia and the Carolinas of Rifts Earth are a savage wilderness where dinosaurs rule and human beings are at the bottom of the food chain. Here, nature runs wild, twisted by alien energies, and civilization exists in tiny pockets scattered across the region. 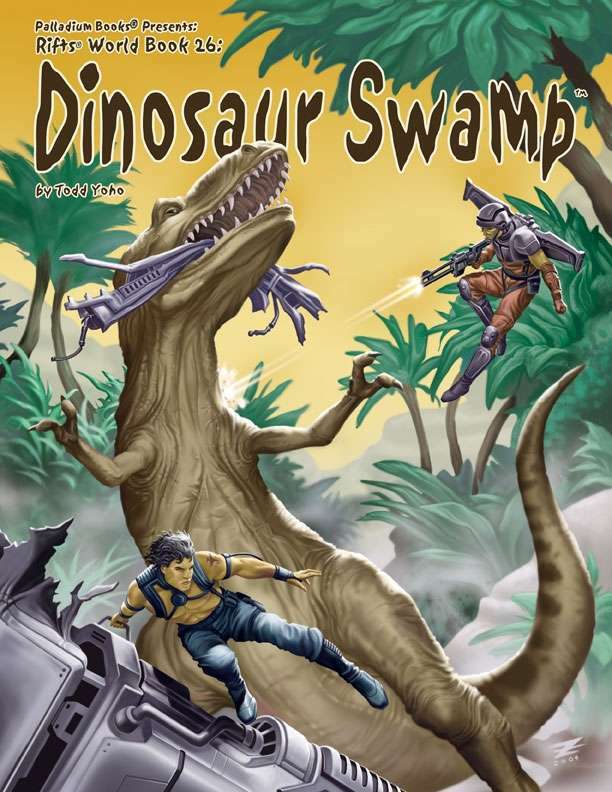 Alien plant life, strange forests, monsters, dinosaurs, one-of-a kind aliens, ancient pre-Rifts ruins, barbarians and strange things found nowhere else are all in Dinosaur Swamp. New dinosaurs, strange alien creatures and man-eating plants. 8 new O.C.C.s plus a few optional and barbarian variants. Eco-Wizardry – a nature based version of Techno-Wizardry. Eco-Wizard weapons, dinosaur weapons and more. The region mapped and described, offering scores of adventure ideas. 160 pages of savage excitement by Todd Yoho.